Tsue ~ That's What She Said: Who does the cooking? I'd love to say that I do. My wonderful husband does, almost all of the time. Not to mention he does all the grocery shopping and vacuums, too. What a gem! It's not that I don't LIKE to cook and bake. I actually really enjoy it. The easy excuse is that my husband gets home from work much earlier than I do. I hate to rush through cooking meals. In fact, I'm have some OCD like tendencies when it comes to the kitchen. The kitchen has to be spotlessly clean before I start on my project. I have to get all my ingredients gathered. Although I own a stand mixer, a hand mixer and a cuisinart, they never see any use by me. Just my good ol' wooden spoon for mixing and I hand chop, slice and dice everything. I only enjoy creating meals and goodies when I can take my time. I'm also very picky about the pieces I use, from the good ol' wooden spoon to my baking dishes. 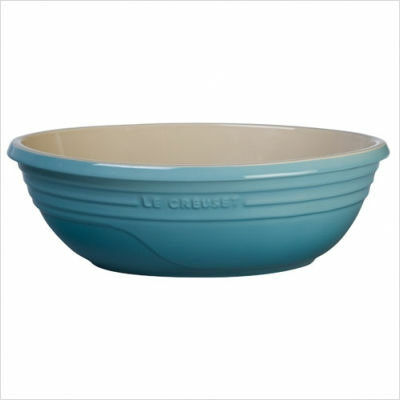 I recently found some wonderful Le Creuset cookware at CSN! 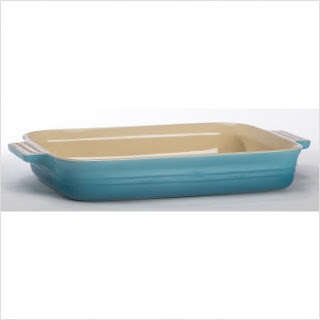 Like this gorgeous rectangular baking dish in Caribbean Blue! In fact, they have an entire line of products in that gorgeous hue! This 2 quart pitcher for serving hot or cold beverages. 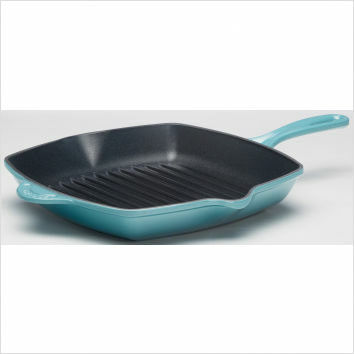 Or this square skillet that not only comes with a lifetime warranty, but is also ON SALE! Gotta have it. Guess what?! Stay tuned for an upcoming review of a fabulous item I will receive from CSN, with over 200 stores, they offer the ultimate in online shopping! Aww....I like cooking... :) Thanks for stopping by and following. I'm now following you back. Thank you for visiting me at MommyIsCrafty & entering my giveaway! Look forward to reading your csn product review! I am following you now! Thanks for the follows. I am now following your blog and via RSS. Thanks for following my blog. Im now following back. Have a great week. 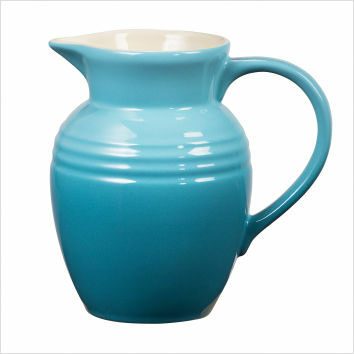 I love that blue Le Creuset stuff, don't you? I have a square grill pan that I bought through Pampered Chef for about $120 so this is a good price on CSN. I like your blog and appreciate that you visited mine. Ooo those dishes are all beautiful! I really love them! Thanks for following me, I am returning it now. You have a wonderful husband. I am not sure I like to cook as I loved it before. Now it's just one more chore I have to do. 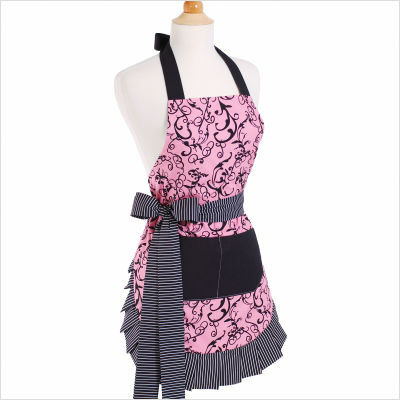 I do all the coking in our house-- and I always wear an apron too. I'd love to do everything by hand, but I just haven't built up my cooking arm muscle yet :) That cooking ware is really cute. I find if the presentation bowl/dish looks nice, I have more fun making what goes in it!